So clearly Linode offers more for the same price: more than a double of disk space, 2 more CPU cores and more bandwidth. This is probably due the fact that they have released their offer after DigitalOcean so that’s some healthy competition right there. Before we start let’s talk a bit about hardware used by those two companies. DigitalOcean at Amsterdam NL (AMS-3) droplets use Intel Xeon E5-2630L v2 at 2.4 GHz. 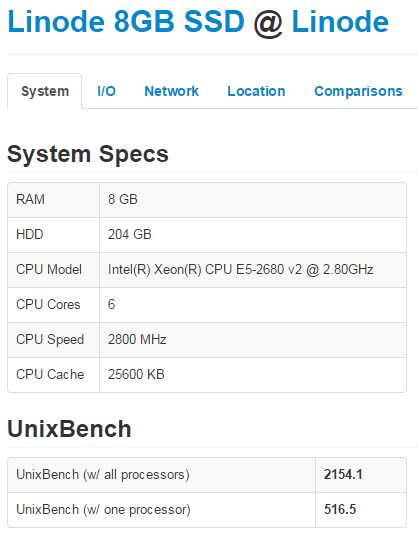 On the other hand a Linode at London shows Intel Xeon E5-2680 v2 at 2.80GHz. So Linode should have a slightly better processor and should get more processing power for the same amount of money. Other than processor, there isn’t a way to detect the type of memory or SSD drives used. Note: DigitalOcean at Netherland’s AMS-1 location “hides” their CPU model behind “QEMU Virtual CPU version 1.0” clocked at 2 GHz. So this is one more reason to choose AMS-3 over AMS-1. DigitalOcean utilizes KVM virtualization while Linode uses Xen. While DigitalOcean have a minimalist approach to their control panel it lacks some important functions: for example you can’t see how much bandwidth have you spent (not that they care since they do not charge if you go over the monthly limit), you can’t have more than one IP allocated to a single droplet, plan upgrades and downgrades can be really complex to do and time consuming creating a significant downtimes. Linode is clearly more feature rich platform. They will provide you much better charts and more options. Their Control Panel is more geeky and their SSH in web console works much better and faster compared to one at DigitalOcean, you can buy and assign extra IPs to your linode, you will get an email if your linode is under high load and it can be even auto rebooted in case it hangs. DigitalOcean offers backups at the cost of +20% on the droplet monthly price. They also offer free DNS hosting and that’s about it. Linode offers backups (at the same price +20%) and free DNS hosting but beside that they also offer some interesting features like Monitoring, Load Balancing and Fully Managed Service (at $100/month per account for all liodes you have). DigitalOcean offers CentOS, CoreOS, Debian, Fedora, Ubuntu as well as preinstalled applications (Ruby on Rails, WordPress, LAMP, LEMP, Django, MEAN, NodeJS, Ghost, GitLab, Docker, Drupal, Dokku, Magento, Redmine). Linode offers: Arch Linux, CentOS, Debian, Fedora, Gentoo, openSUSE, Slackware, Ubuntu but they also offer lot more settings when creating a new Linode (from partition setup to kernels). 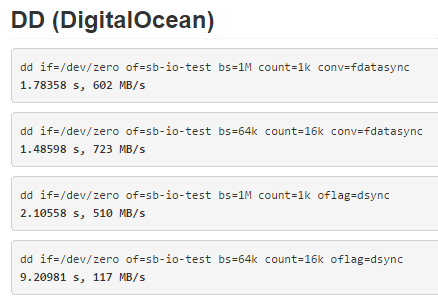 DigitalOcean is clearly a winner: they will have your droplet created in 55 seconds and process is really easy. While the same thing on Linode takes few more minutes and is somewhere complicated: you first create a new linode and then deploy an OS while at DigitalOcean it’s done at once. At Linode you can deploy at United States (Dallas TX, Fremont CA, Atlanta GA and Newark NJ), United Kingdom (London) and Japan (Tokio) while Digital Ocean on the other hand offers droplets at United States (New York NY, and San Francisco CA), United Kingdom (London), Netherlands (Amsterdam) and Singapore. Linode has better offer of locations in US but they lack Netherlands as really important European location. I’ve been using DigitalOcean since Feb 2013 and I haven’t noticed any major downtime. In case of some works or scheduled maintenance they send on time emails and they really keep the downtime minimal. 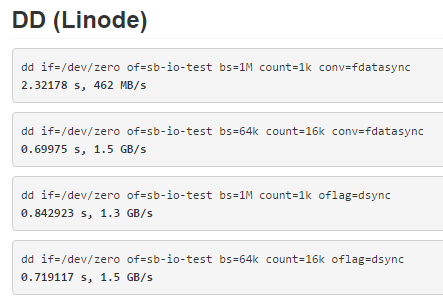 I’ve been using Linode for a few months and they also seem stable and reliable. So they are both stable and unlike many people claim that they would never host “mission critical” stuff on DigitalOcean for a reason, I’m doing exactly that since Feb 2013 without any problems. Even this site is hosted on DigitalOcean since then. In the start DigitalOcean support was really helpful bur recently the quality of their support is bit lower, but on the other hand they offer amazing amount of tutorials and really a helpful community. Linode is famous for their good support and I’ve also found really really helpful community on their IRC (almost like a unofficial live chat support). 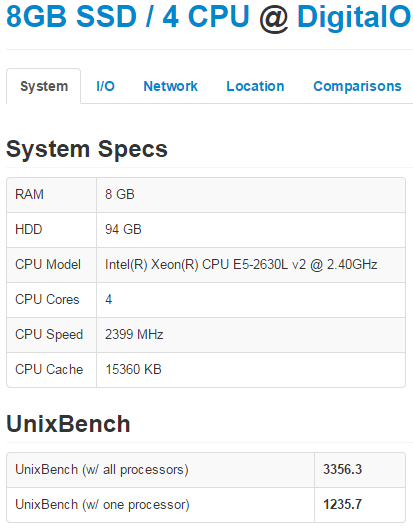 Linodes single core UnixBench score is 516.6 vs 1,235.7 for DigitalOcean. At a single core level a DigitalOcean is almost twice faster than Linode. This is really interesting and totally unexpected result! But Linode has 6 cores and DigitalOcean has only 4 so it will be faster anyway, right? More cores means more power, right? WRONG!!! Even though DigitalOcean has 50% less cores their total score is 50% better than Linode’s (2,154 compared to 3,356) meaning that every single DigitalOcean CPU core performs 100% faster than every single Linode’s core. And that’s another unexpected result! This is also very odd and might suggest that Linode is oversold or something but I’m really not sure. Network speeds are pretty close so we can call them even. Things aren’t always as they might seem. Even Linode has slightly better processor and twice more cores my benchmark results showed that it’s not faster than DigitalOcean. In fact it’s almost 50% slower. On the other hand Linode IO performance of is twice (or more) times better than IO performance of DigitalOcean. In the end – whichever you pick – you’ll be happy with it since they are both really good virtual hosting providers. Compared to regular (non SSD powered) VPS hosts they are both really fast.